It’s Monday morning and a lively team is discussing their assignment which is due later that evening. Members chat about the lecture that prepared them, the buzzing forum threads on the subject, and the peer reviews which they conducted that week. An unusual but exciting learning scene at the office! While such a scene is typical at top universities scattered across the country, it has not been in office environments. For most employees, professional development traditionally leaves much to be desired, if it is provided at all. However, the rapidly changing education technology landscape provides much opportunity for disruption, which we are already witnessing organically in our classes. Recently, more than ten employees of 3Pillar Global, including the company’s CEO, took part in Leticia Britos’ “Design Thinking Action Lab” course from Stanford’s Epicenter. 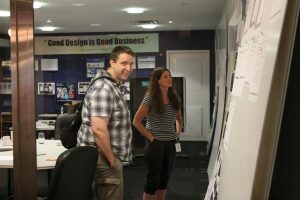 One of the company’s managers served as an impetus for the idea, after enrolling in the course as a natural extension to a design conference he attended at Harvard. 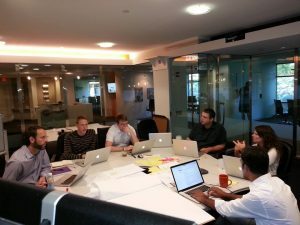 Once he spread the word, enrollment quickly gained steam and a positive nod from senior executives, who were not disappointed with their experience: “All in all, it’s something we would recommend to anyone.” Indeed, the NovoEd platform aligns very well with authentic professional development as a result of its collaborative and experiential focus. Each week, 3Pillar’s employee teams bounced around ideas and provided pro-active feedback before submitting assignments which closely aligned with their work objectives. While the fluidity of implementing impromptu professional development speaks volumes to 3Pillar’s innovative nature and focus on employee growth, the story is also an encouraging case for those of you interested in bringing something similar to your workplace. With the amazing suite of entrepreneurship classes we have starting later this month, the timing couldn’t be better!